Every now and then, my mind starts to drift in a fanfiction sort of direction, when I wish that I could hop into someone else’s playground and do some storytelling. There have been times when I’ve indulged myself, and today is another one of those days. If I could, I would love to reboot the classic TV show Quantum Leap. Yesterday I spent some time musing about the Christians echoes we might possibly find in this classic TV show. I couldn’t really help myself. I loved this show when it was on the air back when I was in high school and college. And I love watching the episodes on Netflix now. But here’s the thing: while Quantum Leap was a great show, it had kind of a lousy ending. In the series finale, Sam winds up having a chat with “God,” who reveals that Sam is going to have to keep leaping through time, that each leap would get successively harder and harder. And then, at the end of the episode, the fans were informed that Sam Beckett never found his way home. Talk about a gut punch! But I still love this show, and I think it would be a blast to see it return to TV. I think it would be great to see a story about a time traveler leaping from life to life, striving to put right what once went wrong. Only in my reboot, things would be a little different. So here’s my pitch: the new Quantum Leap would not be about Dr. Sam Beckett. Instead, it would be about his son. We know that at one point, Sam did make it home, but only temporarily. In Season Four, Sam was able to go home and be reunited with his wife, Dr. Donna Eleese. Well, the result of that reunion was a son named either John (after Sam’s father) or Tom (after his brother). For now, we’ll call him John. Like his father, John is a genius and prodigy and he has a singular obsession: he wants to save his father. In the pilot episode, we would learn that that, when it became clear that Sam Beckett wasn’t going to make it home, the U.S. government pulled the funding for the Quantum Leap project. They shut down Ziggy, the supercomputer who ran the project, scrapped the imaging chamber that allowed Al to speak to Sam, and left Sam to his own fate. As a result, Sam failed his mission and is now stuck. He’s Leaping through time randomly. No one knows where or when Sam is. Sam’s body is still in the future, but the moment the removed it from the waiting room, Sam went catatonic and he can’t be awakened (meaning that no one can talk to the people that Sam is Leaping into). And for John, that’s not good enough. He wants to bring his father home. John has spent his life studying his father’s theories and he believes he’s found a way to not only locate his father, but break him out of this vicious cycle. He approaches the government and tries to get his father’s equipment (which has been tucked away in some super secret facility, probably next to the Ark of the Covenant). The government flat out denies him the chance, saying that someone high up in the command chain is blocking them. John leaves the meeting extremely frustrated. But his attempt has caught the attention of someone who can help, namely Sammy Jo. Sammy Jo is his half-sister, someone who worked on the original Quantum Leap project back in the day. She too wants to see their father rescued. So they agree to work together. They track down the stuff they need and then basically steal the components for Quantum Leap. John then modifies the equipment so that he can Leap not only within his lifetime, but into Sam’s as well. He’ll use his dad’s last known temporal coordinates for a starting point, but he’s not going to stop until he brings Dr. Sam Beckett home. And so, just like his father, he steps into the quantum leap accelerator and vanishes. It works. John finds himself in another person’s life. Sammy Jo, serving as John’s holographic adviser, works to find Sam. And he has to hurry. In Sam’s timeline, the government is going to shut down the project and he’ll be lost. Not only that, but the government is also trying to track down John and Sammy Jo for their break-in at the storage facility. Finding Sam isn’t easy. Ziggy the supercomputer doesn’t remember exactly who Sam was, and so John finds himself on his own little Leap, trying to put right what went wrong on Sam’s final documented mission. Toward the end of the episode, John succeeds in finding his father and helps him complete his original mission. Father and son are reunited, but only briefly, because before John can bring Sam home, Sam leaps away. John is devastated, but Sammy Jo points out that if John returns home, they can work to track down Sam wherever and whenever he leaped to and try again. Sammy Jo leaves the imaging chamber to begin the process. But before John can be returned to his own time, the government raids the facility and damages the equipment. As a result, John doesn’t return home. Instead, he leaps. His brain gets “swiss cheesed” as well, and now he’s basically in the same position as his father. Sammy Jo is heartbroken, especially since it looks like the government will shut them down again. But before the government agents can pull the plug, they’re ordered to stand down. Someone wants to talk to Sammy Jo. That someone is Admiral Al Calavicci. It turns out that Al himself was the government insider blocking John from getting the equipment in the first place. The reason why was because he was feeling guilty over abandoning Sam all those years ago. So far as he was concerned, no good could come of resurrecting Quantum Leap. That’s why they’re going to scrap the project again and this time, they’ll destroy everything. Sammy Jo pleads with Al not to do it, finally telling him that they found Sam. She still believes that John can bring Sam home. That causes Al to stop and, more importantly, change his mind. He asks Sammy Jo if she really believes John can do it. Sammy Jo is certain. And so Al gives the go-ahead to restart Quantum Leap. And so Sammy Jo re-enters the imaging chamber to help John as he leaps from life to life, striving to put right what once went wrong, hoping that each Leap will be the one to bring him to his father so that the two of them will finally be able to go home. From then on, the shows would follow the Quantum Leap format: John would Leap into a person’s life, going as far back as the late 1940s, he and Sammy Jo would work to fix whatever went wrong, and then he’d be off again. So what do you think? 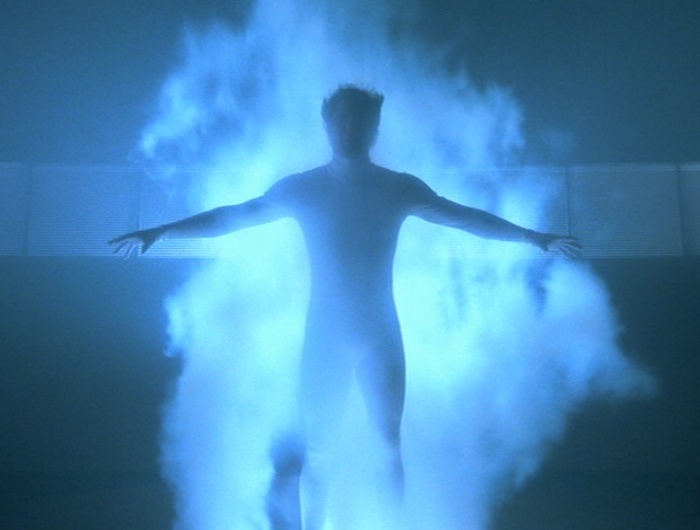 Does the world need a new version of Quantum Leap? Or let me ask you this: what old TV show or movie do you think needs to be rebooted for today? Let me know in the comments! EDIT: I added a little bit more to this idea in a subsequent post. You can check it out here. Oh my. If I did, it was unintentional. I only ever saw a few episodes of Superbook growing up. Just to explain: in the second season Chris’s cousin and uncle come to visit. His uncle gifts them with two new toys: a lifesize Gizmo and (gasp!) a computer. He drops his son Uri off and goes to do whatever sciencey thing he’s supposed to be doing, leaving the kids to fight over who gets to play with the computer. Superbook falls on the keyboard in the scuffle and gets sucked by the computer, as does Ruffles (Chris’s dog), who becomes lost in time. Uri and Gizmo leap after Ruffles, and Chris and Joy spend the rest of the season trying to find all three in the computerized Superbook while Uri and Gizmo search for Ruffles by flashing to different parts of the Bible. I’d watch every episode of that! Is give anything for a QL reboot. I’ve just, for the first time, finally finished the original Quantum Leap, and have been thinking of a reboot big time. You hit the nail on the head with this one dude! Almost exactly the way i had envisioned it! The only thing that you left out was the Evil Leapers and Lothos. I think that was an aspect of the story line that they could have pursued more. I would modify it slightly, and make them the reason why John was denied access to his dad’s equipment was because an agent from Lothos was the one denying them. Have Al come out of retirement right at the perfect moment to stop them from shutting down the new project. Even get him to have the project sponsored by the government. A little twist that we could add is instead of John being like Sam, make him a bit more hot headed maybe? Also, a plot twist. Maybe Lothos has gotten a hold of Sam’s leaps, and is using hi as the evil leaper? You know, I think a quantum leap video game would be quite interesting, with the new video game consoles they could create wondrous things as well as downloadable content to create more to the story. All still guiding you, helping you, kind of like L.A. Noir esque, or murdered. Idk, that’s my idea. That’s a really great idea, Rana! I know a lot of game developers were dabbling in episodic content a few years ago. A Quantum Leap game would fit the mold perfectly!